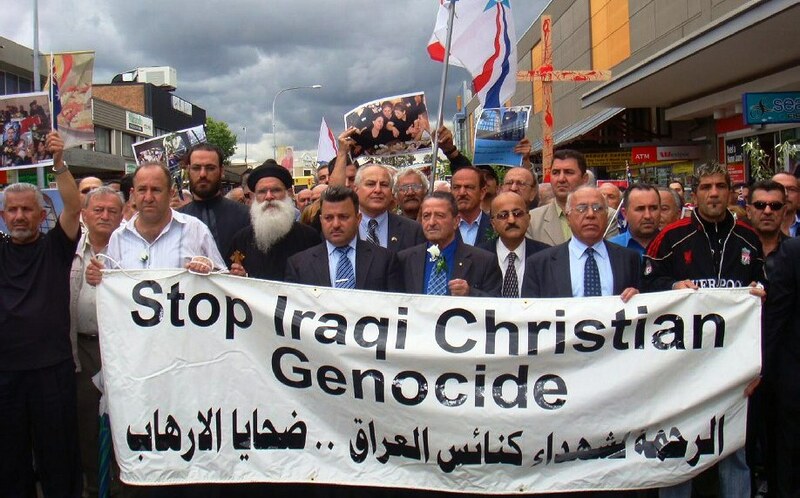 “Another wave of persecution will be the end of Christianity after 2,000 years” of it in Iraq, one Iraqi Christian leader recently declared. In an interview earlier this month, Chaldean Archbishop Habib Nafali of Basra discussed how more than a decade of violent persecution has virtually annihilated Iraq’s Christian minority. Since the 2003 U.S.-led invasion, the Christian population has dropped from 1.5 million to about 250,000—an 85 percent reduction. During those 15 years, Christians have been abducted, enslaved, raped, and/or slaughtered, sometimes by crucifixion; about one church or monastery has been destroyed every 40 or so days—meaning about 135 Christian houses of worship, said the archbishop. Although “Violent Religious Groups” (such as the Islamic State) are “Very Strongly” responsible, two other societal classes seldom associated with the persecution of Christians in Iraq are also “Very Strongly” responsible, says the report: 1) “Government officials at any level from local to national,” and 2) “Non-Christian religious leaders at any level from local to national.” Additionally, three other societal groups—1) “Ethnic group leaders,” 2) “Normal citizens (people from the general public), including mobs,” and 3) “Political parties at any level from local to national”—are all “Strongly” responsible for the persecution of Christians in Iraq. In other words, virtually everyone is involved. Violent religious groups such as IS and other radical militants are known for targeting Christians and other religious minorities through kidnappings and killings. Another source of persecution are Islamic leaders at any level [including governmentally sponsored], mostly in the form of hate-speech in mosques. Government officials at all levels are reported to threaten Christians and “encourage” them to emigrate. Also, normal citizens in the north have reportedly made remarks in public, questioning why Christians are still in Iraq. What is happening in Iraq is a strange thing, but it is normal for Muslims, because they have never treated Christians well, and they have always held an offensive and defaming stand against Christians…. We used to live and coexist with Muslims, but then they revealed their canines [teeth]…. [They don’t] have the right to storm houses, steal and attack the honor of Christians. Most Muslims do this, the Ottomans killed us and after that the ruling nation-states understood the circumstances but always gave advantage to the Muslims. Islam has never changed. I’m proud to be an Iraqi, I love my country. But my country is not proud that I’m part of it. What is happening to my people [Christians] is nothing other than genocide. I beg you: do not call it a conflict. It’s genocide… When Islam lives amidst you, the situation might appear acceptable. But when one lives amidst Muslims [as a minority], everything becomes impossible…. Wake up! The cancer is at your door. They will destroy you. We, the Christians of the Middle East are the only group that has seen the face of evil: Islam. The government has only helped foster such anti-Christian sentiments. For instance, in late 2015 it passed a law legally forcing Christian and all other non-Muslim children to become Muslim if their fathers convert to Islam or if their Christian mothers marry a Muslim. If they are people of the book [Jews and Christians] we demand of them the jizya—and if they refuse, then we fight them. That is if he is Christian. He has three choices: either convert to Islam, or, if he refuses and wishes to remain Christian, then pay the jizya [and live according to dhimmi rules]. But if they still refuse—then we fight them, and we abduct their women, and destroy their churches—this is Islam!…This is the word of Allah! Considering that Muslims in Iraq are indoctrinated by such an anti-Christian rhetoric from youth on up—starting in the schoolrooms and continuing in the mosques—it is unsurprising that whenever the opportunity presents itself, many Muslims turn on neighboring Christians. In one video, for example, a traumatized Christian family from Iraq narrates how their young children were killed and burned alive, “simply for wearing the cross.” The mother explained how the “ISIS” that attacked and killed her children were their own Muslim neighbors, whom they ate with, laughed with, and even provided educational and medical service to—but who, once the opportunity presented itself, turned on them. Iraq’s Christians are on the verge of extinction, less because of ISIS, and more because virtually every rung of Iraqi society has been, and continues to be, chipping away at them. Raymond Ibrahim, author of the new book, Sword and Scimitar, Fourteen Centuries of War between Islam and the West, is a Distinguished Senior Fellow at the Gatestone Institute and a Judith Rosen Friedman Fellow at the Middle East Forum.